Fair Winds Press, 9781592338535, 176pp. Light Magic for Dark Times is magic itself. Lisa Marie Basile’s eloquent and compassionate spellbook could benefit anyone who feels his or her inner power emerging. Simply beautiful. A poet’s foray into nonfiction, Light Magic for Dark Times is revelatory—a richly-brewed infusion of everyday magic exactly when many of us need it most. Basile’s voice is soothing, and she remains the perfect amount of Scorpio mysterious—she never tires the reader with long personal stories, but instead slips in little details of her interesting life, just as much as context allows. This makes her feel like a warm, curious guide who you’d want to get to know over blue lotus tea, probably served in antique Italian bone china owned by someone’s Strega Nona. … What I like most about Light Magic For Dark Times, aside from its beautiful illustrations and narration, is that I feel like I did a good amount of healing work just doing the exercises in the books before I even tried any of the spells. This book is perfect for the beginner who has yet to see themselves reflected in the practices of nature-based faiths. 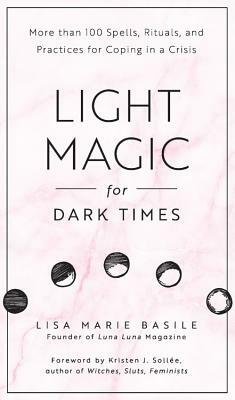 With rituals that combat burnout, foster productivity, and heal internal strife, Lisa Marie Basile's Light Magic For Dark Times shows readers how seemingly esoteric spellcraft actually applies to their everyday lives. Lisa Marie Basile’s Light Magic for Dark Times is a treasure. She takes self-care and injects it with magic, with thought, and with the complexities—light and dark—that make us human. Beautifully illustrated and laced with poetics, this is a guidebook for a new spirituality, one that infuses ancient wisdoms and ritual with a modern sensibility. It’s the book I want to buy for all my friends.